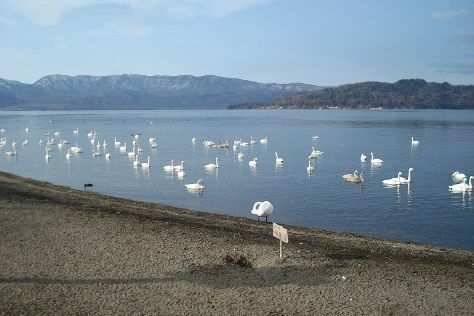 A small town amid big scenery, Teshikaga-cho sits in a national park. The dramatic landscape on display includes two vast lakes surrounded by forested hills, making for a picture-perfect view of Japan's wilder side. Many Teshikaga-cho itineraries include a stargazing tour, with the night sky's wonders particularly easy to spot and appreciate here. To cap it all off, the town lies an area known for its hot springs, and many of the accommodations boast onsite onsens, traditional Japanese bathhouses. Teshikaga-cho is in Kawakami-gun. Plan your trip to Teshikaga-cho and other Japan destinations using our handy Japan visit planner . The town of Teshikaga-cho itself has a good array of hotels, traditional ryokan, and a couple of more budget-friendly hostels. The more luxurious among them have onsite onsens and restaurants, and with proximity to the main train line, the area offers convenience for travelers just arriving or soon to leave. But the surrounding rural spots have just as much in terms of accommodations, particularly close to the lakes, with clusters of ryokans, some campgrounds, and luxury resorts.